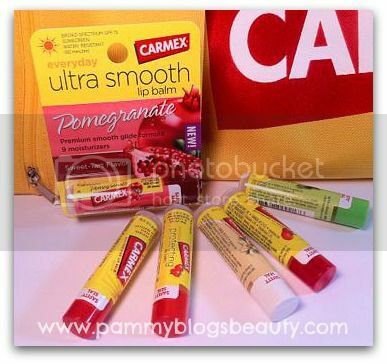 Pammy Blogs Beauty: Giveaway from Carmex: Beach Bag and Carmex Lip Balms!!! 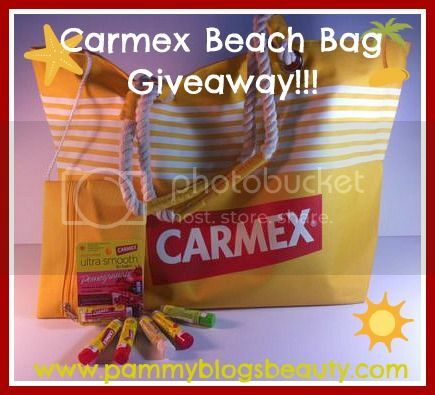 Giveaway from Carmex: Beach Bag and Carmex Lip Balms!!! Are you not ready to say "Good Bye" to Summer? I know that I'm not! Extend your Summer fun with this adorable Beach Bag Giveaway from Carmex! As a Carmex Blog Squad member, I get access to new Carmex products and Giveaways. For this review and Giveaway, I tested out Carmex's new Pomegranate Everyday Ultra Smooth Lip Balm and a Carmex Beach Bag. The Giveaway is for another set just like the one I tested! Plus, Carmex is including an assortment of 5 more lip balms for the winner as well! For my product reviews and Giveaway details and entry form, please keep reading after the jump! I adore a good beach bag. During the summer, I practically live at the pool. Also, I always take at least one beach vacation. Now that I have a 7 month old baby, I am always carting around a TON of stuff when I hit the pool or beach. This Carmex bag is roomy without being bulky or heavy. Best of all, it is cute! It is a canvas bag with a Carmex logo. The bag features two straps that are made of rope. The rope straps and the stripes give this bag a whimsical nautical feel. Also, there is a little inner zippered bag and the bag snaps shut with one magnetic snap closure. I love it that there is a little inner bag because I always want a safe place to put my keys, money, and phone. Otherwise, I end up digging through (and emptying) the entire bag looking for those items! Inside the bag are lip balms in all six flavors: Original, Cherry, Strawberry, Vanilla, Lime Twist, and Pomegranat. I am a huge fan of Carmex lip balms! They are made with an ultra moisturizing formula and have a water-resistant SPF 15! These are just perfect for summer days and the beach when you need good lip moisture and sun protection. Pomegranate is Carmex's new lip balm flavor. Aren't Pomegranate products just popping up everywhere? I, for one, am a fan of Pomegranate flavors/scents. This Pomegranate Lip Balm has the classic Carmex scent/flavor with the addition of an overlay of a sweet-tart like Pomegranate scent/flavor. The combination is nice. The lip balm is somewhat soft and it glides on very smoothly. It gives your lips just the slightest hint of tingle and feels very moisturizing. The SPF is broad spectrum and is water resistant for 80 minutes. So, now on to the Giveaway Details!!! Prize is shipped directly to winner by Carmex. Pammy Blogs Beauty is not responsible for items lost or damaged in mail/transit. Prize fulfillment is through Carmex. Contest runs from July 20, 2012-Aug 17, 2012. Winner has 48 hours to respond to winning announcement or a new winner will be selected. 1. Please see the rules listed below. 3. You must follow Carmex on twitter. 5. Answer question in comment form below: "What did you do for fun this Summer?" 6. You must Follow Pammy Blogs Beauty on Facebook. I love being able to host Giveaways for you guys!!! It is my way to say "thank you" for being a loyal Pammy Blogs Beauty reader!!! Good luck with the contest and thanks for reading and entering!!! I have always heard good things about Carmex lip balms. I would be delighted to win and give the product a try. For fun I am traveling home to OH to see my family. It has been 8 months. I am excited to see my nephew. He is going to be 3 and has grown tobe 45 inches tall. That's right. I did say he is going to be 3 and is almost 4 feet tall. Crazy. I didn't really have anything exciting going on this summer. The most fun I have had has been blogging! I have been loving it! Summer isn't over yet!!! Hope to get in some motorcycle riding! Plan to go to the beach next month. For fun this summer my fiance and I have attended a few game parties and we spend time in our pool relaxing! It's so nice! Unfortunately, I haven't done anything really fun this summer, as I'm working on my book series. I did get to go to Boston, but it was a quick in-and-out trip for work. :( Here's to hoping I get to do something fun soon! Not to much-a couple family reunions.. I did a gaming convention and county fair with 2 of my good friends. I haven't done much yet, but I'm planning to go to Canada soon for vacation! I'm excited to go because I've never been! Since it has been incredibly hot, we've stayed in the pool for fun this summer! I went to the beach with my friend and her family. That was a great break! A week in the mountains was wonderful! im going to the beach! To be perfectly honest not much! The heat has made me too lazy to move. Thank you for the giveaway, Pammy. Unfortunately I lost my job so this summer I haven't had the money to do anything. But next summer I want to go to Tahoe and Vegas! This summer I took my 12 year old ziplining because she really wanted to go! I haven't really done anything this summer just school and work, wish I had more time to do things. I've had a fun summer because my favorite relatives have come to visit us and go to the ocean beach! Went to disneyland and took my dogs to the dog beach! Thanks for having this giveaway, have a great day! Swimming in the river a lot! Thanks for sharing your review with your readers. Glad to hear that you liked the new pomegranate flavor and the beach bag.